In Japan, the number of people who take part in the Seven Gods of Fortune Pilgrimage after the start of the new year is increasing. 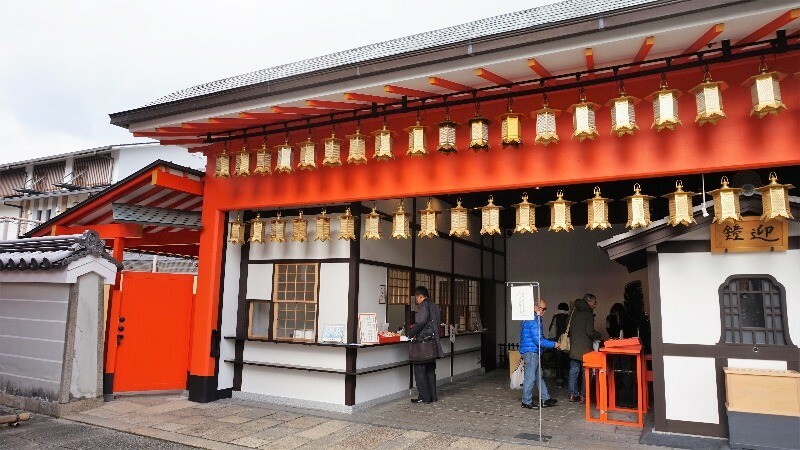 The pilgrimage takes visitors to shrines and temples where the Seven Gods of Fortune are enshrined. It’s become such a popular event for Japanese people that there are even tours designed around visiting the shrines and temples. 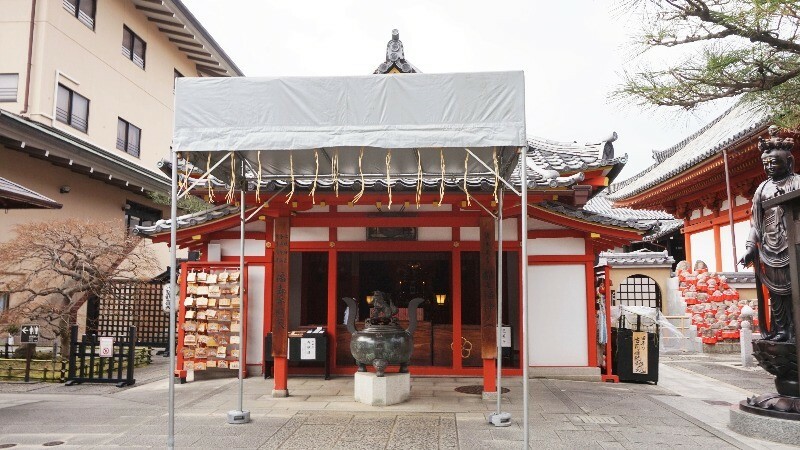 In this article we will take a look at Kyoto’s Seven Gods of Fortune Pilgrimage, which is said to be the oldest in Japan, the things I enjoyed on the pilgrimage, and things to watch out for on your own pilgrimage. 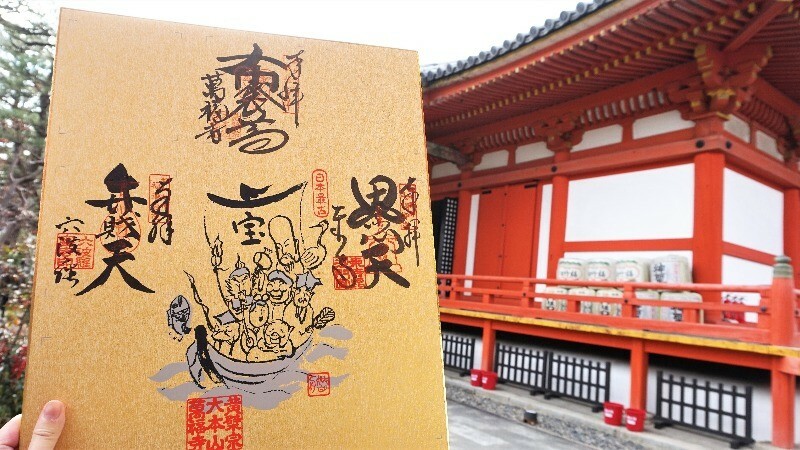 ・What is the Seven Gods of Fortune Pilgrimage? ・What are the Seven Gods of Fortune? What is the Seven Gods of Fortune Pilgrimage? The Seven Gods of Fortune Pilgrimage consists of visiting temples and shrines that are dedicated to the Seven Gods of Fortune. In Japan, the period from January 1st to January 15th is called “Matsu no Uchi”. During this time, it is believed that the gods visit your home and that by visiting the temples or shrines you can receive divine protection and escape hardships in the coming year. The event is held from January 1st to 31st. After praying at the shrine or temple, it is possible to get proof of your visit by getting a goshuin (shrine/temple stamp). 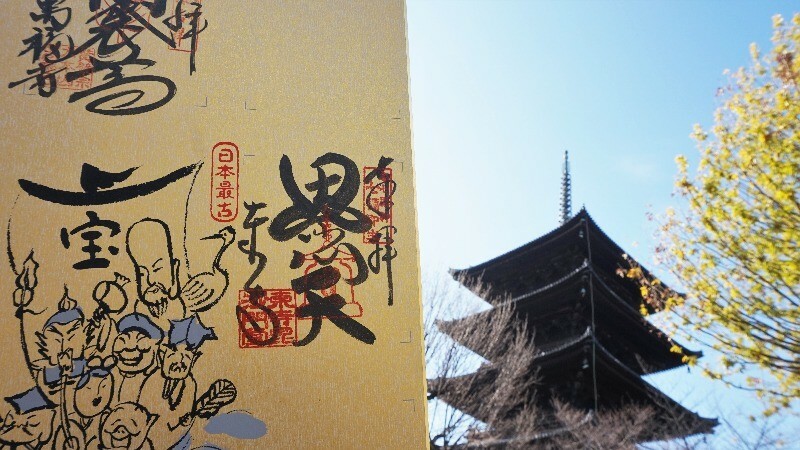 The goshuin has the name of the shrine or temple and the name of the deity written in black ink. It is believed that you get a small piece of the deity when you receive the stamp, so be sure to treasure it! For this pilgrimage, you can get a special paperboard for your stamps at the reception counter of any of the shrines or temples. 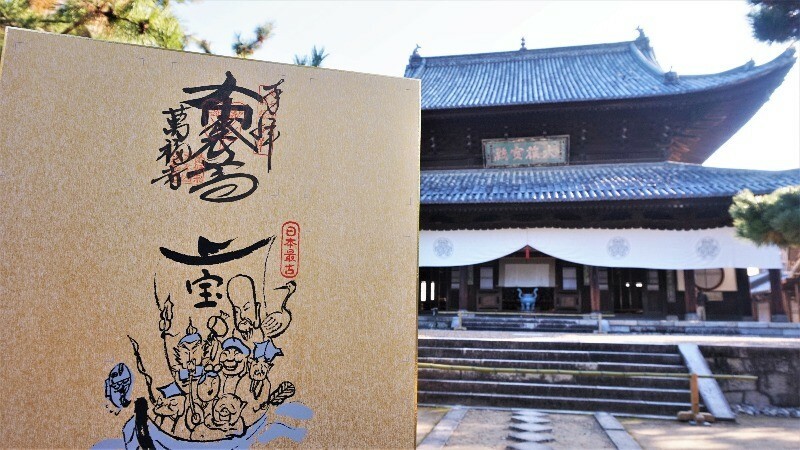 We recommend that you get your goshuin stamp written on this paperboard (if you have your own book for goshuin it is okay to use that, too). The paperboard is available at all of the temples/shrines. The size and type vary depending on the temple or shine. What are the Seven Gods of Fortune? Exactly what type of gods are the Seven Gods of Fortune? Let’s take a look at each of them and their powers. Ebisu is the god of thriving business, large catches of fish, and abundant harvests. If you use all of your knowledge and work hard, it is said that he will certainly reward you with luck. Daikokuten is god of the kitchen. In agricultural villages, he is said to bring abundant harvests. For merchants, he is said to bring business prosperity. Bishamonten was originally a god of treasure, but is now a god of war. In addition, he is said to grant 10 different virtues including popularity and a long life. The only goddess among the Seven Gods of Fortune, she is said to bring fortune and prosperity. Said to be an apotheosis of water, and since flowing water is similar to the flow of music, she is also worshiped as a goddess of music. Said to be an incarnation of the southern pole star, Fukurokuju is a god originating in Chinese Taoism. He is said to bring long life, health, and can ward off bad luck. Also said to be an incarnation of the southern pole star, Jurojin brings health, longevity, and happiness. Hotei is said to be the incarnation of a monk who lived in China, or an incarnation of the Maitreya. He is the god of good fortune and good marriage matches. This pilgrimage takes visitors to the shrines and temples dedicated to the Seven Gods of Fortune, but the truth is, there is no set order in which to visit the shrines and temples. It is perfectly okay to start with one near your home or the hotel where you are staying, one that is dedicated to a particular god that you like, or a temple or shrine that you like. From there you can visit the shrines and temples freely, in any order. Everyone can move between the shrines and temples at their own pace. Some might visit one a day, and some try to get to all seven in one day. For those who want to visit all seven shrines and temples in one day, it is best to plan ahead and consider the most effective route. You might want to consider following the route that I will introduce later in this article. There is a special procedure to follow to get your goshuin stamp. I will explain some basic manners for visiting the temples and shrines here. Try and follow them during your visit. 1. Before passing through the gate (called a sanmon at a temple, or a torii at a shrine), bow once. 2. Purify your hands and mouth at the chozuya (water basin). 3. Pay homage at either the main hall or the worship hall. At a temple, put your hands together (as if to pray) and bow once. At a shrine, bow twice, clap twice, then bow once more. 4. 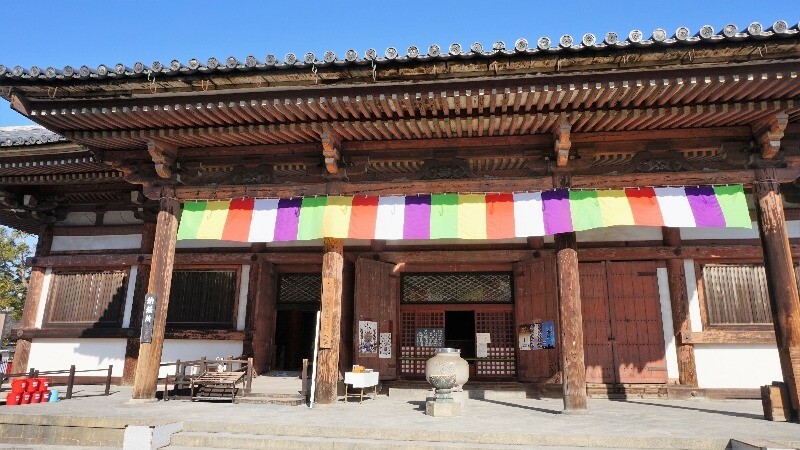 Pay homage at the worship halls where the Seven Gods of Fortune are. 5. Get your goshuin from the shuinjo, a special reception desk for getting the stamp. It is important to pay homage before you get your stamp. It is said that you would not get any benefits from your visit if you don’t pay homage before getting the stamp. As they say, “Seeing is believing!”, so I set off on my own pilgrimage. I wanted to visit all seven of the shrines and temples in one day, so I did some planning ahead and worked out the route that would be the most effective for me. I will talk about the route here and the things I noticed and felt while I was visiting the shrines and temples. Excited for my first Kyoto pilgrimage, I set out for Manpuku-ji Temple, located near Obaku Station in Uji. After passing through the gates, you will see the Tennoden (shown in the picture). Here you can find the god of good luck and good marriage matches, Hotei. After paying homage, I headed to the shop to get the special paperboard for collecting the goshuin stamp. It cost ￥2,000, and you could choose the color and shape that you wanted. I chose one that was gold (for good luck) and rectangular shaped with large a picture of the Seven Gods of Fortune. For those who don’t want to collect all of the stamps themselves, they also had a paperboard that already had all of the stamps on it for ¥5,000. Even if you decide to get one of these, I still recommend visiting all seven of the shrines and temples, even if it takes you some time to complete the pilgrimage. This is the paperboard that I bought. The gold somehow makes me feel like it will bring good luck. I was kind of excited to have them write and stamp the paperboard, but it seems that at the first stop they already have the goshuin stamp on the paperboard when you buy it. This unfortunately means that I didn’t actually get to see them write it in person. Next up was To-ji Temple! 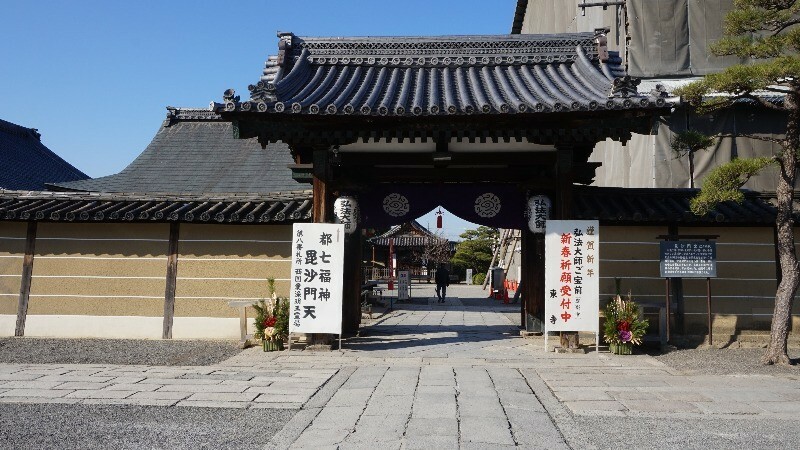 After passing through the gate, the hall on your left is where you will find Bishamonten, the god that can bestow you with 10 virtues, including popularity and longevity. 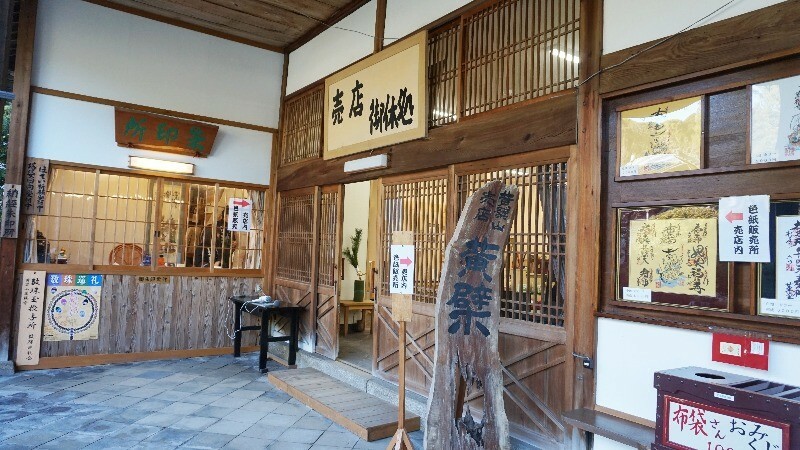 After paying homage, I went to this hall to get the goshuin stamp. Here I actually got to seen them write the goshuin stamp in person! It really is better to see it yourself! 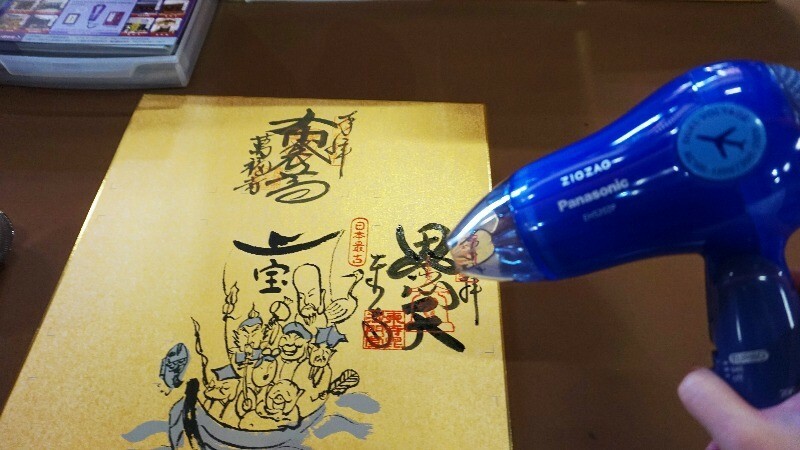 After getting the goshuin stamp, they have a hairdryer on hand that you can use to dry both the black calligraphy ink and the stamp ink. Be sure to make sure everything is nice and dry! If you don’t, the ink may get on your clothes or in your bag, and it also might smudge or ruin the stamp! I also took a photo with the five-storied pagoda! Aren’t the Chinese characters cool? 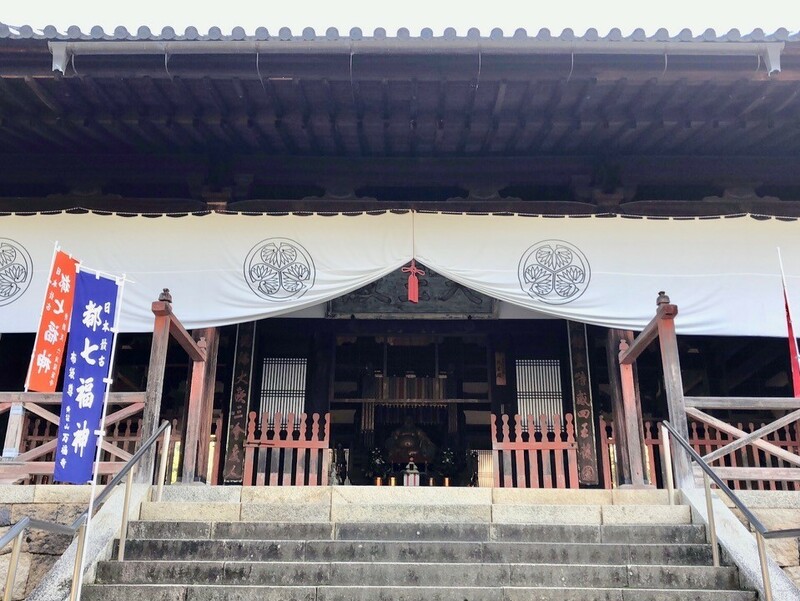 Visit time: 8:00 a.m. to 5:00 p.m.
Next, I went to Rokuharamitsu-ji Temple, home to Benzaiten, the goddess of wealth and the arts, and the only female deity in the Seven Gods of Fortune. Benzaiten is in this hall, located directly in front of you after you come through the entrance. After diligently praying, I got my stamp at this reception counter to the right of the main hall. After making sure everything was dry with the hairdryer, I snapped a photo with the main hall in the background. After getting three stamps, the paperboard starts to look more beautiful. If you pay close attention, each one has a slightly different writing style, which I found really interesting. Since this has gotten quite long, we will stop here for now. Part 2 will cover the remaining four shrines and goshuin stamp. Will I be able to make it to the rest of the shrines and temples in one day? Will I be able to collect all of the goshuin stamp? Check back for Part 2 to find out!